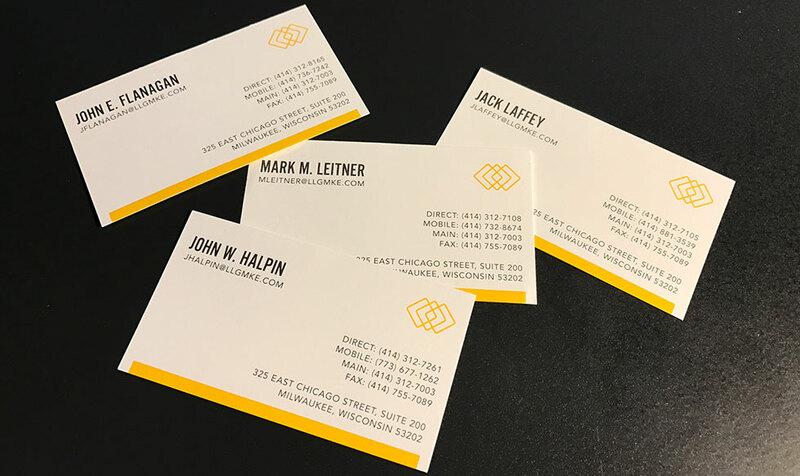 Mark, Jack, and Joe enlisted our team to help them craft a brand and website for the new firm, Laffey, Leitner & Goode LLC. This project would prove to be our most difficult and most rewarding yet. 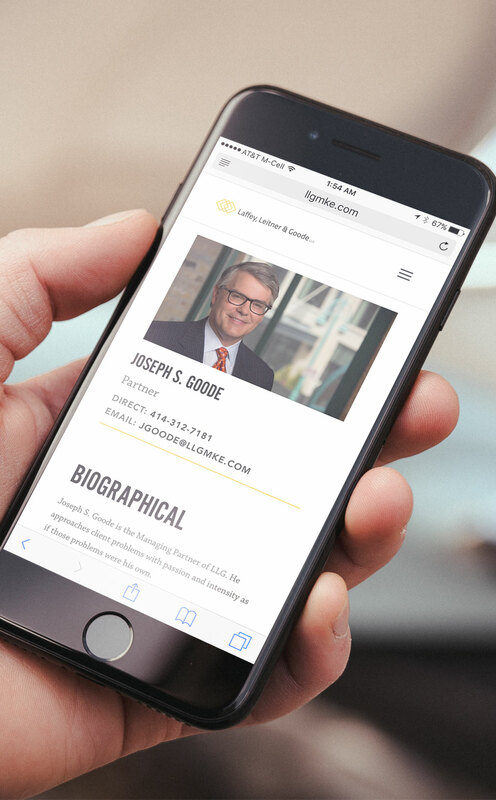 LLG has a thirst for tackling the most complex legal tangles and problems that can be thrown at them; the years of experience of the three founding partners proves that. 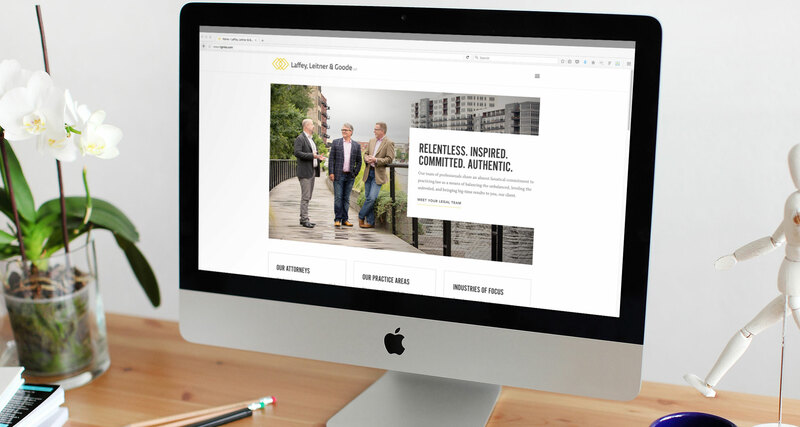 But, they are also some of the most authentically cool guys you’d want to meet.This project required a lightning-fast turnaround, and as we demonstrated our knack for visualizing their unique vision for their firm, our responsibilities grew enormously. Turns out that there is a lot to do when launching a brand new law firm. 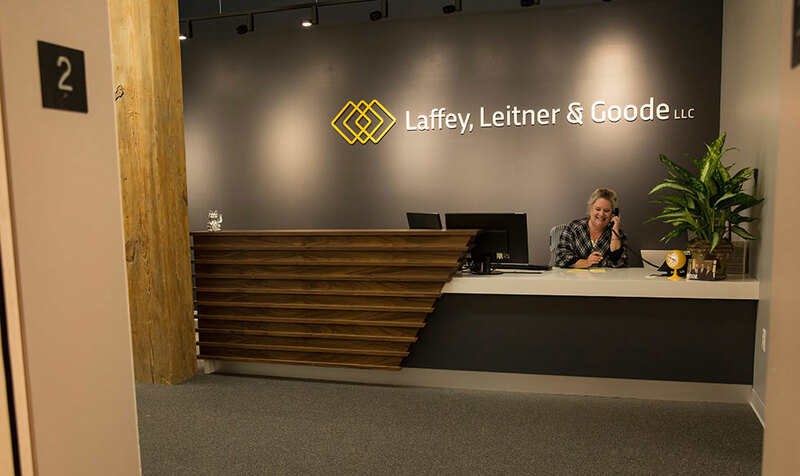 The mark was designed to communicate the order and symmetry that the Laffey, Leitner & Goode team bring to the most complex and chaotic legal issues. The classic route would have been to throw some initials in a box and call it a day, but this team is anything but classic. Their approach to practicing law is a beautiful blend of art (rock n’ roll, mostly) and science (think quantum mechanics or Stark conjectures). Their brand needed to reflect that. The complex geometry of the mark is balanced with a combination of classic typefaces, giving the brand added structure and personality. The color palette is kept minimal and the focus is on the messaging; when these guys speak you’d best listen up, otherwise you’ll miss an outrageously funny story or a hell of an interesting insight. 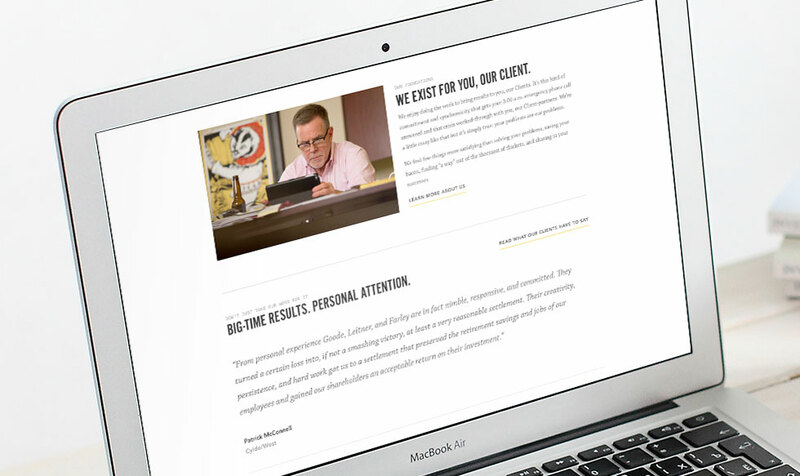 For the website, we designed an experience that focused on the content. We had a serious ace up our sleeve in John Sibilski, who provided us with stunning photography to use throughout the site. Having beautiful images like that made our design philosophy stupid simple; get out of the way. 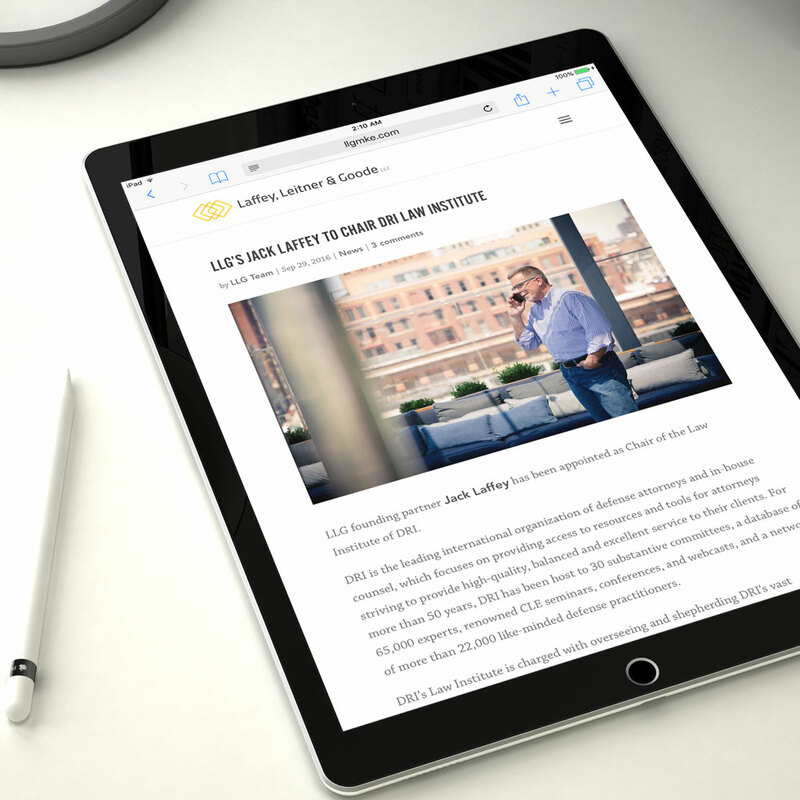 With the visual BOOM in full force, we focused our attentions on clean layouts, user-friendly navigational elements, and a responsive design that scales beautifully from desktop to mobile. The praise from both LLG’s and our own peers keep coming in for this project. It’s unique in its space, it’s bleeding-edge without relying on any tricks and, most importantly, it’s incredibly engaging. Those are all awesome things to hear. While this was tough, with hard deadlines and mountains of deliverables, Jack, Mark, and Joe really pushed us to take our work to the next level. But, as with every project that we undertake, we strive to work with our clients on a deeply personal level. The single best outcome from this great project are the friendships we’ve forged with our boys at LLG. When good work becomes great work, and great work leads to great friends, man . . . . that right there is, in a word, BOOM.